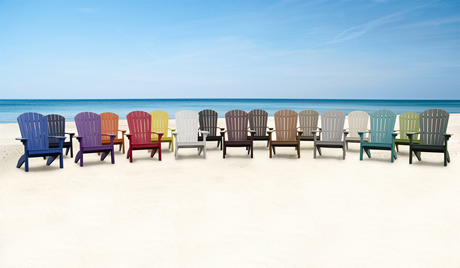 Available in color palettes from bold and vibrant to neutral, our poly color selections are used to personalize your outdoor furniture. Crafted from recycled materials, poly lumber is fade-resistant and engineered to withstand sun, rain, and harsh elements. Virtually maintenance-free, your outdoor furniture will never need to be treated, painted, or refinished. GREENGUARD GOLD certified, our Sunbrella outdoor fabric options are an eco-friendly way to upholster your Amish outdoor furniture. In addition to providing a sustainable product, Sunbrella fabrics are engineered with a lifespan two to ten times longer than conventional fabrics. 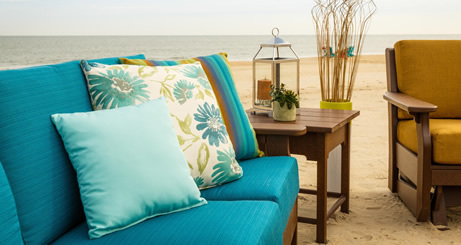 Pair a solid color or pattern with your poly color to create outdoor furniture that is uniquely yours.